Looking for a cheap ticket to Kuala Lumpur? 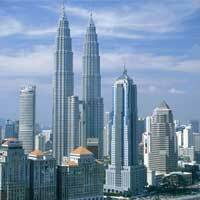 Here you can search all major low-cost airlines for cheap flights to Kuala Lumpur. Before you book a flight you can use Utiket to find the cheapest flights to Kuala Lumpur for AirAsia (AK), Malaysia Airlines (MH), Malindo Air (OD), FireFly (FY), Singapore Airlines (SQ), Garuda Indonesia (GA). All flight data are real-time and accurate. Follow the links to search and book your cheap ticket to Kuala Lumpur directly with the airline or one of our partnering travel agents. The metropolitan area of Kuala Lumpur is being served by several airports: Kuala Lumpur International Airport, Sultan Abdul Aziz Shah Airport. You can find more information or the cheapest tickets to all these airports here on Utiket. Sultan Abdul Aziz Shah Airport but often called Subang Airport was Kuala Lumpur's main airport before the opening of KLIA in 1998. At present it mainly serves turboprop domestic flights of Malaysia Airlines subsidiary FireFly. Read more about Kuala Lumpur Sultan Abdul Aziz Shah Airport.